We train and hunt our Harris's Hawks always in the company of others. Hawks are introduced to one another in stages. After being caught up and jessed out, new hawks are tethered in the weathering area near one another. We also man them by going for walks, each carrying a hawk. During creance training, Tom holds one hawk on the fist while Jennifer flies another. Then we reverse roles. When the hawks are ready to be flown free, Tom throws one hawk into the tree and calls it back while Jenn's hawk watches from the fist. After Jennifer has thrown and called back her hawk, then we both throw our hawks into the same tree and call them back quickly. We monitor each hawk's response to the other hawk at every step of the training process. Next we have both hawks follow us along a tree line, calling them down occasionally for a tidbit. After a couple of following sessions, the hawks are taken straight into the field to start hunting. Our hawks are always around others. Once fattened up the group is housed together over the molt in a large open-style flight chamber that is 20 X 10 X 10 feet. 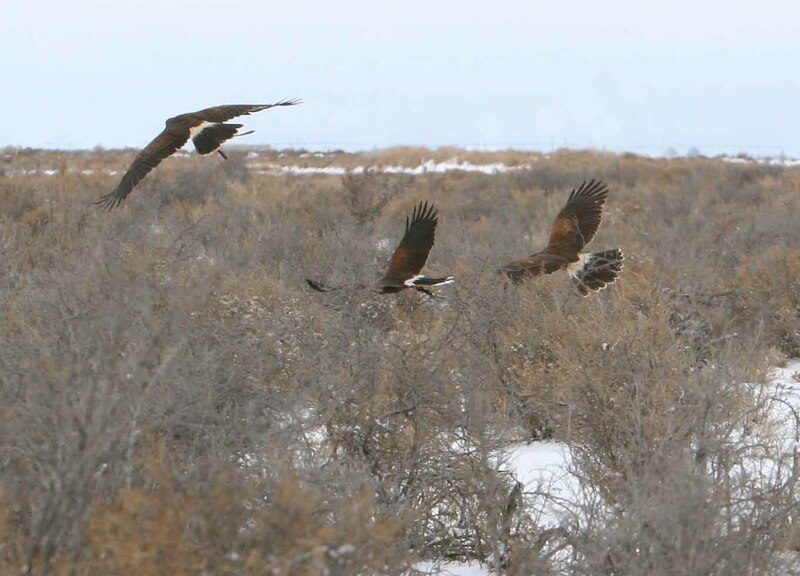 During the hunting season, each hawk is tethered in an enclosed, covered weathering area, in sight of but not within the reach of other Harris's Hawks. When at hunting weight, the group is only turned loose together when we are in the field and ready to start hunting. Our book, The Harris's Hawk Revolution, has an entire chapter devoted to socialization of Harris's Hawks.